A conventional shoulder replacement device mimics the normal anatomy of the shoulder: a plastic "cup" is fitted into the shoulder socket (glenoid), and a metal "ball" is attached to the top of the upper arm bone (humerus). In a reverse total shoulder replacement, the socket and metal ball are switched. The metal ball is fixed to the socket and the plastic cup is fixed to the upper end of the humerus. A reverse total shoulder replacement works better for people with cuff tear arthropathy because it relies on different muscles to move the arm. In a healthy shoulder, the rotator cuff muscles help position and power the arm during range of motion. A conventional replacement device also uses the rotator cuff muscles to function properly. In a patient with a large rotator cuff tear and cuff tear arthropathy, these muscles no longer function. The reverse total shoulder replacement relies on the deltoid muscle, instead of the rotator cuff, to power and position the arm. Reverse total shoulder replacement is a highly technical procedure. Your surgeon will evaluate your particular situation carefully and discuss the risks of surgery with you. Risks for any surgery include bleeding and infection. Complications specific to a total joint replacement include wear, loosening, or dislocation of the components. 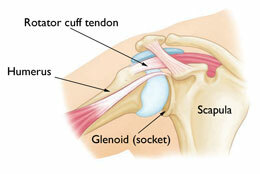 If any of these occur, the new shoulder joint may need to be revised, or re-operated on. 1: Do follow the home exercise program prescribed by your doctor. 2: Do avoid extreme arm positions, such as behind your body or your arm straight out to the side for the first 6 weeks. 4: Don't lift anything heavier than 5 lbs. for the first 6 weeks after surgery. 5: Don't push yourself up out of a chair or bed, as this requires forceful muscle contractions. 6: Don't participate in repetitive heavy lifting after shoulder replacement. Long-Term Outcomes After rehabilitation, you will most likely be able to lift your arm to just above shoulder height and bend your elbow to reach the top of your head or into a cupboard. Reverse total shoulder replacement provides outstanding pain relief and patient satisfaction is typically very high. Early studies of the results of this surgery have been very promising, but currently no long-term studies exist. This is an area for future research.